This foam-like plastic is a major source of plastic pollution. Polystyrene is a leading cause of plastic pollution, and Maryland’s new law could spur other states to take action. The United Nations’ Global Goals calls on countries to create sustainable economies. You can join us in taking action on this issue here. The Maryland General Assembly overwhelmingly voted to ban polystyrene foam food containers on April 4, becoming the first state in the country to prohibit this common plastic and ubiquitous form of pollution, according to the Baltimore Sun. The legislation was championed by Baltimore Delegate Brooke Lierman, who has tried to pass the measure three separate times. "Maryland may be a small state, but we have the chance with this legislation to lead the country on eliminating this horrible form of single use plastic from our state," Lierman wrote in a Facebook post leading up to the ban. "We have a duty to future generations to clean up the mess that has been made — this bill is an important step!" The new law, which goes into effect July 2019 and allows businesses one year to use existing foam products and find alternatives, builds on previous local efforts to ban polystyrene in the state, and puts Maryland at the forefront of the movement to restrict plastic production in the US. While Gov. Larry Hogan has not yet signaled whether he will support the legislation, the bill passed with enough votes to override a possible veto, according to the Baltimore Sun. "I'm very proud to have sponsored this bill and really thrilled that Maryland is at the forefront of this issue," Sen. Cheryl C. Kagan, a lead sponsor of the bill, told Global Citizen. "Foam is lightweight and does not respect jurisdictional boundaries, which is why banning it county by county was never going to be the right solution in terms of our efforts to protect the Chesapeake Bay and all our waterways and communities." "The more that other states and jurisdictions ban styrofoam, the more economic pressure there will be to create alternatives," she added. Kagan added that environmental groups and youth activists were critical in getting broad support for the bill. Polystyrene is often mistakenly referred to as styrofoam, but it differs in key ways. The petroleum-based material is commonly used for takeout containers, coffee cups, and packing peanuts, while styrofoam is more commonly used in construction and crafts. The coffee chain Dunkin Donuts, for example, sells more than 1 billion polystyrene cups each year. Polystyrene can’t be recycled, breaks down into little bits of microplastic, has been deemed a carcinogen, and is a scourge for the world’s marine life. The Waterfront Partnership of Baltimore, which has long advocated for statewide restrictions on plastic production and better recycling incentives, celebrated the new law. The Waterfront Partnership spends $150,000 a year on floating trash-collecting devices called Mr. Trash Wheel. 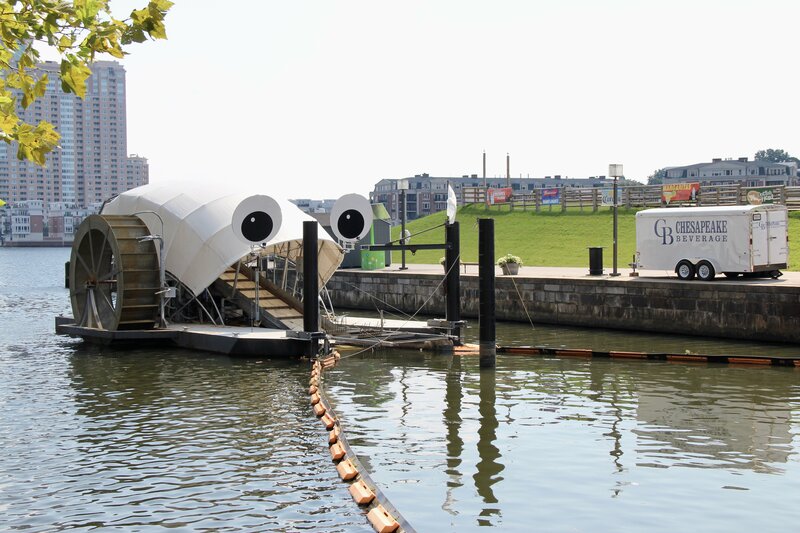 The googly-eyed machine looks like a big crab and sits at the mouth of the Jones Falls waterway and uses the stream’s current to collect trash. After storms, the machine can collect 60 to 70 dumpsters’ worth of garbage that volunteers then sort through. Since 2014, Mr. Trash Wheel has collected more than 1 million bits of polystyrene from the water, said Lindquist. “It’s one thing to pick up plastic bottles, because you can see them and collect them. Polystyrene doesn’t work like that,” he told Global Citizen. “Polystyrene packages break down into endlessly smaller and smaller pieces. You could spend an entire day on just a small segment and never pick up every piece of styrofoam. “When it’s small enough, fish and crabs and shrimp start eating it, and that carries more pollution into our food chain,” he added. In recent years, the impact of plastic pollution on marine life has spurred a global reckoning. More than 60 countries have taken action to restrict plastic, massive businesses are investing in alternatives, and everyday people are driving change. The new ban covers uses of polystyrene as a food and drink container, but it features significant exemptions. So while people in the state won't receive foam takeout containers or coffee cups, businesses will still be able to use polystyrene to cover meat products and for all non-food items, including packing peanuts. Additionally, foods that are packaged outside the state can still use polystyrene, an exemption that makes accommodations for the fact that no other state bans the material, but one that also could hamper the bill’s effectiveness. “We’d love to put Mr. Trash Wheel on a diet and put him out of work,” he said.